We hold all the major quality and safety certifications including ISO, OHAS, CHAS & Construction Line Gold. "From pre-sales to installation and post-sales Able Canopies have been very helpful and accommodating. Able Canopies have listened to our requirements and helped us to create a solution to fit our needs. The installation team were approachable, professional, friendly and worked well with our site team." Click on an image to find out more details about the projects. 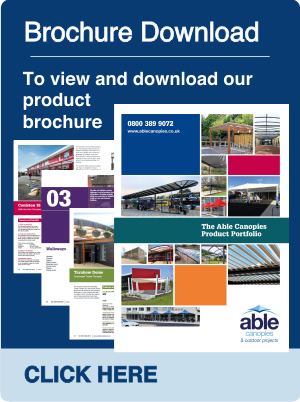 Able Canopies specialise in providing quality commercial canopies, solar carports & canopies, canopy awnings, walkways, shelters and shade systems designed to help you to use your outdoor space more effectively. Each canopy is professionally installed and uses our tried and tested project management skills and service to ensure any installation is expertly finished with the necessary floor materials, electrical work, security options and landscaping. We have installed thousands of canopies and shelters to schools, nurseries and local authorities throughout the UK, as well as to the sporting, leisure, hospitality, health and care sectors. All our products are designed to create versatile and usable canopies and shelters which complement your environment perfectly. Our products make ideal playground shelters, outdoor classrooms, entrance canopies, alfresco dining areas and covered seating areas. We're proud to be known throughout the industry as "The Canopy Experts". In addition to providing the finest canopy systems in the UK we also offer a free no-obligation site survey carried out by our expert surveyors, to ensure you receive the ideal canopy or shelter solution. We provide the widest range of canopy products in the UK, from awnings to Solar Carports & Canopies and everything in between. To find out about our entire product range click the links in the menu above. So you've arrived at our website, which is great! Maybe you've had a look around at some of our products and decided which one you'd like. Maybe you can't decide?! Give us a call, or drop us an email, and chat to our friendly team and we'll help you through the whole process. Here's a quick overview of what will happen when you pick up the phone or send us an email. 2. 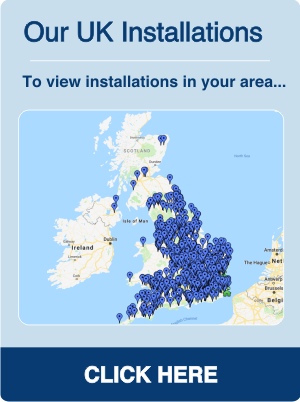 Book a survey - Our sales team will also check where you are in the country and whether your requirements are something we think we can help with and then it's time for us to get out there and meet you face to face! We will organise for one of our Surveyors to visit you at a time convenient to you and complete your free site survey. 3. The Survey - Our Surveyor will chat with you about your requirements, whether you had a product in mind and what they recommend for you. 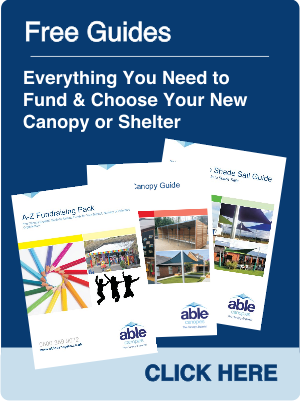 They will also go through your Quotation Pack which contains lots of background information on Able Canopies. They will take careful measurements of the area and all this information will be sent off to our pricing team for them to create your free quotation/s. 4. Design - If you require a bespoke design, our Design and Build team will then work to create your unique vision, once you are happy with the design we will price this up for you. 5. Over to you - Once we have put your quotation together we will send this over to your via email and also post a copy to you - you can then add this to your Quotation Pack to keep all your canopy information in one place. We will then contact you a few days later to make sure you received your quote and to check whether you have any questions. Once you have reviewed your quotation let us know your thoughts and any changes required - we are happy to amend quototions to better suit your requirements if needed. 6. Ordering - When you have decided if you want to place an order - let us know, we shall then send out your order form and you will be assigned your dedicated Project manager to oversee you installation. If you require planning, our Planning team will also contact you to guide you through this process- at no extra charge to you. 7. Installing your product - Your Project manager will work with you to find the best time for your installation. School holidays fill up fast so if you want a holiday booking let us know as soon as possible so we can reserve a space for you. We have extensive experience of installing during term time, or your organisation's opening hours, and we make every effort to cause as little disruption as possible, so term time installations are always a great option too. 6. 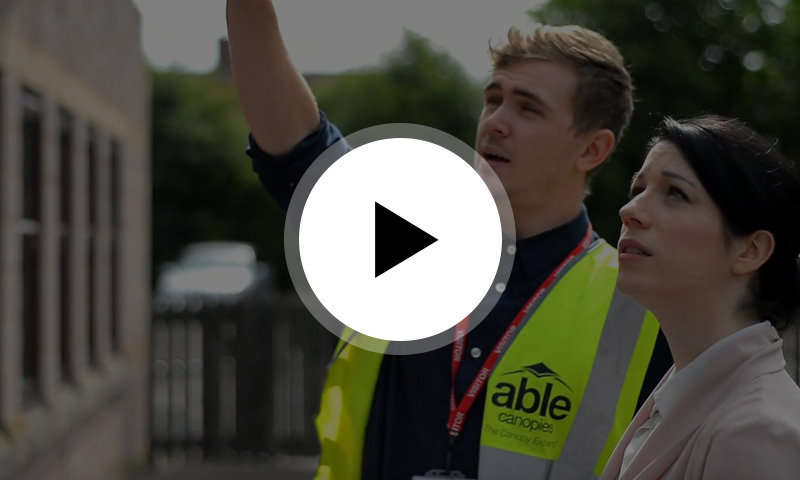 Aftercare - Once installed, our fitters will check you are happy with the finished product and ask you to complete our Satisfaction Note so we can collect all your feedback an ensure we continue to develop our service to meet your needs. We will then send out your After Sales pack which will include your guarantee, if applicable, your maintenance schedule which advises on how to care for your canopy product and your £250 voucher of your next canopy. 7. Enjoy your new shade and shelter product!